Indian health authorities prepared defences against the spread of disease in flood-hit Kerala state on Monday as water receded and a huge clean-up gathered pace after the worst floods in a century killed more than 200 people. 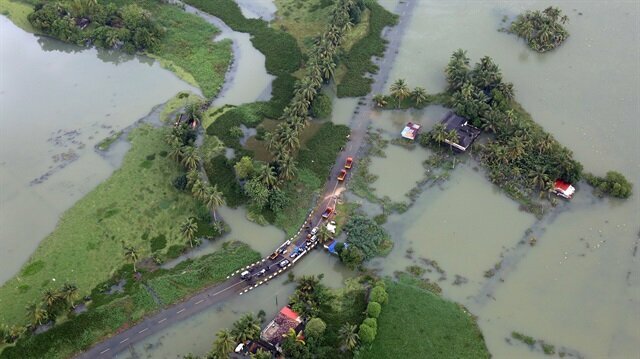 "The biggest challenges immediately ahead are cleaning of the flood-hit houses, rehabilitation, and prevention of water-borne diseases," said Mahesh P., a village-level officer from Rayamangalam, some 45 km (28 miles) from Kerala's financial capital of Kochi. Anil Vasudevan, who handles disaster management at Kerala's health department, said the state was preparing to battle any outbreak of diseases in the relief camps and preventive medicines were being distributed. "The bulk of the credit for the rescue goes to the ordinary citizens. The army, the navy, the local authorities assisted them," Mahesh said. "The flood has bonded the people like never before, with people sharing whatever they had." Kerala Chief Minister Pinarayi Vijayan said there was no shortage of food in the state as traders had stocked up ahead of Onam, the state's biggest festival which falls on Aug. 25.